We have a pecking dis-order. Lacking modern federal standards, commuter trains are unlikely to reduce congestion caused by single occupant cars. Further blocking commuters from their desire to waste less time in traffic, most of our fifty states have not delegated transportation and taxing authority to the most effective level. With states poorly suited to solve metro problems and failing to delegate effective regional authority, train service and congestion worsens. Instead of adjusting authority for the future, most states still delegate transportation to 3,042 counties (pictured above, a level of government designed for when horses were the primary transportation helping Americans settle just-platted farmland). Yet today, 81% of Americans live in urban areas. While most transit subsidy comes from a county-wide sales tax, people increasingly know the properties that benefit most are those near transit and, to be fair, should pay more. This sales tax misfit multiplies when considering that under 2% of counties have 10% of residents regularly using transit to get to work. The other 90% pay for transit they may never use. Thus, transit is “for other people.” This deeply ingrained attitude in the American mind makes it a low-priority service. In an era of chronic fiscal un-sustainability, transit loses. Since trains serve mostly suburban areas, they lose even more at perennial budget crunch-time. They also lose their best redevelopment tool. This is a lousy deal for almost everyone. Compounding these poor politics, a legal mismatch traps transit in its muddle. States and counties, in turn, expect 19,429 municipalities (most with true authority over only their streets) to take increasing responsibility for central stations… despite being regional infrastructure and, in several cases, having national significance. Hence after several decades of talk about updating Manhattan’s Penn Station, it may get a new concourse by 2025; but it still will be a terminal… and not the more efficient, higher-capacity through-station standard most European regions have converted to. The 20th Century’s twenty-five or so years that we lost to the competition in the European Community have added another twenty-five years in this Century. America’s pecking dis-order underlays the ten metros analyzed on this website and explains why trains transport taxpayers no differently than half a century ago. Central stations are the venue to understand this. They also are one of the most convenient synergies between environmental and fiscal sustainability. The Force is with stations. If we want trains as a regional service to reduce congestion and transportation costs, we start by re-organizing government so it can modernize central stations. Since more train commuters will use a station that works better, these changes make it more likely the rest of the system can modernize. The modern central station comes first. Without that, today’s pecking dis-order will continue frustrating the good intentions of most mayors and civic leaders… as it has for most of this century. So…let’s make every station update as part of converting today’s lousy deal into one that almost everyone wants. 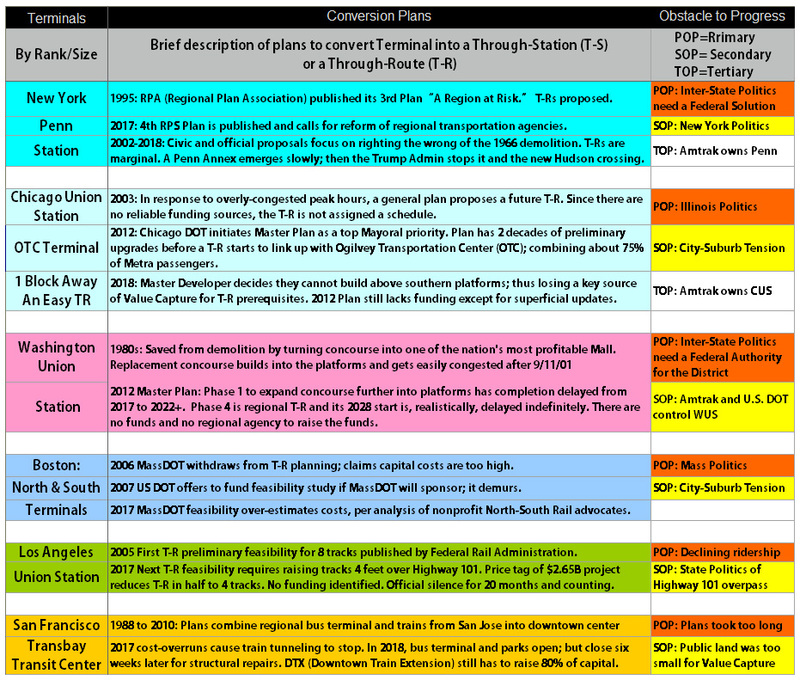 Transit’s misplaced authority fits the historical framework proposed in how stations evolved (recall the first 3Ms, Marvels, Mix-ups, Make-overs). As the 21st Century progresses, the 4th M (Masters of transportation) will emerge… but only if regional policies sync the benefits of transit with the people and properties that benefit most. In the second chapter, we explored the key issues in improving central stations and network effectiveness. That Overview explains how regional governance and good real estate deals are two keys that must work together. While most central station real estate is improving because mayors marshall land use authority, rail service still worsens and, eventually, limits redevelopment downtown and in sub-regional centers. In this third posting, I introduce how the Big Picture evolution needs to develop specific strategies to prepare for the very difficult process of rearranging authority so regional transportation gets governed well. Common problems and their four strategies are summarized below. I also cite the station mostly likely to solve this problem so we make governance work. To improve commuter trains as regional assets, the key is converting terminals to through-stations. This maximizes passenger through-put and helps redevelop regional and sub-regional centers around stops that participate; thus increasing fares and tax revenues. Philadelphia is America’s only through-route. But, it does not maximize the asset. A comprehensive regional authority is proposed to help Philly and, we hope, other rail networks become a tool to generate more property revenue. To make Value Capture work as a long-term source to pay bonds, stabilizing transit’s revenue must come from the region’s TODs and not just a county-wide sales tax. San Francisco is the biggest attempt to gather VC from land with multiple owners. But it failed to bring trains downtown; causing many VC deals to fall short. We propose a strategy that can finish the downtown train station as a regional asset. To control costs using alternative delivery methods, Boards must be held accountable. In 2009 and facing elections in which they appeared to have broken their promise of new commuter lines centered on Union Station, Board members of Denver’s Regional Transportation District (RTD) set up a new private scheme to share the benefits of transit and to control costs. To compensate for state negligence in funding and supervision of this vital public service, Uncle Sam must help regions reorganize transportation governance. Regional authority, frankly, is needed to through-route the two stations most desperate for it: New York’s Penn and Chicago’s Union. Starting by strengthening MPOs’ planning, federal funding and standards ultimately must transfer commuting authority to a regionally elected Board. This transfer of power to taxpayers is proposed in the culminating chapter exploring steps that federal policy must take. The Preview of Where Stations Improve. To make it easier, political evolution needs a portfolio of proof positives showing how change works. Our portfolio for commuter trains starts with the three Philadelphia Center City through-stations made in 1983. Produced mostly by municipal moxie, this lesson from the nation’s only through-route is it helped redevelop Center City well. But, other parts of the region largely has not utilized this. Sub-regional centers benefit more only if trains are governed as a metropolitan asset. Following Philly, our second chapter contrasts the successful transit build-out in the Twin Cities with its limits imposed by a county-based, state-controlled, governor-appointed regional council. An antidote is obvious in the next chapter where Denver’s elected RTD has produced the nation’s best transit progress in the past decade. If authority has two-sides of the same coin of the realm (regulatory law and tax law), the next two chapters address the nation’s fumbled trend to fund transit by collecting from landowners who benefit most. San Francisco’s failure to bring trains downtown indicates further that only metropolitan authority can improve train service significantly. Essentially, a new deal is proposed to involve SF’s southern suburbs and San Jose. While California’s devolution of authority makes this possible in the north, LA still struggles to use rails to reduce road congestion. The proposal for LA to accelerate California’s devolution also gives other multi-metro states — such as Texas and Florida — a hopeful prototype. The Preview of Where Stations Don’t Improve. In all the above chapters, a modern federal standard for investing tax dollars will certainly help metros minimize how much they repeat similar mistakes. But, federal authority also must help organize metropolitan authority. The best place to start is in the Federal District and its poor coordination with suburbs in two states, particularly as they converge on Union Station. Our proposal here for using Uncle Sam to establish the District’s metropolitan governance. Then, this can be used more easily in cities such as Baltimore and Boston whose state DOTs, while better than most, still cannot build what both cities need; downtown tunneled through-routes. Finally, there is the crisis of America’s biggest and most poorly integrated systems. The New York region and Chicagoland operate the nation’s four largest systems and serve over 1.45 million taxpayers daily in which nearly 50% go through 4 central terminals. Compare only these two regions’ commuters to the 1.72 million who take domestic flights daily from the nation’s 5,194 airports. Compare this to how fully funded airports are by the federal government and its high standard. Clearly, even a modest federal rail standard would have a significant impact. Even modest federal help in reorganizing authority between states (particularly New York and New Jersey) and within them (particularly Illinois) would have a significant impact in correcting our busiest and worst stations. After all eleven chapters on metros are posted and you have critiqued their proposals, all these issues are brought together in a summary chapter that details a proactive role for Uncle Sam, as The Daddy, who makes sure that commuters doing-the-right-thing get rewarded with better service. The new deal for 21st Century metropolitan transportation gets forged long-term within the timeless principles of American politics that were applied in Uncle Sam’s other major mid-century intervention: the standardization of federal roads using the gasoline tax. These road policies that accompanied the New Deal were, in the 1950s, expanded and institutionalized in the Interstate system. The naysayers arguing the “states rights” position were proven wrong. Uncle Sam served to set the standard and organized the gas tax and, thus, helped every level of government build what was the greatest infrastructure network of the 20th Century. This website’s goal is to suggest how the principles that worked, then, can be updated to solve the issues posed in the cartoon above. Always, states will suspect Uncle Sam of taking money. So, our focus is to demonstrate how modern metropolitan authority can solve problems of transporting taxpayers to work. To achieve this, we redefine Uncle Sam’s job as providing some venture capital and, equally important, the knowledge of what works so every region that wants to improve its trains can do so cost-effectively. The next generation of policy will detail Uncle Sam’s role in promoting sustainable surface transportation. While federal funding might shrink more, that shirk of federal responsibility must be compensated with metros receiving proper taxing authority — derived mostly from states and counties — so that regional rail can be modernized enough to compete with cars. Most of these chapters that post in 2018 will help us see how an effective rearrangement of authority stimulates solutions; including alternative delivery. To reiterate future postings … November’s installment begins that long track of rearranging authority by previewing our portfolio of progress… and pitfalls. Philadelphia is America’s only through-route, but still needs to maximize it. The Twin Cities have a county-based build-out, but trains barely change habits. Denver’s region-based build-out has a better chance. With a more complete transportation authority, the Bay Area may be the first to make Value Capture work as a sub-regional tool. And, Los Angeles may be the first sprawling metropolis to figure out a new deal so enough commuters use transit. While states giving proper authority to metros is a principle that will produce the above progress, Uncle Sam still must guide it. The third and final Preview (posts in December) summarizes the four remaining metros in the NEC (DC, Baltimore, New York and Boston) and the western-most legacy systems of Chicagoland. Uncle Sam’s role is fundamental in reshaping 20th Century transportation habits. In fact, there is little hope for those legacy systems being brought into the 21st Century without new federal laws that empower regions and improve their learning curve while reducing their cost curve. Like the 20th Century’s gas tax, Value Capture schemes may mature into transportation’s 21st Century cash cow. It all depends on whether we rearrange our governments to work together to serve us as the U.S. It is time to make America’s pecking dis-order past tense.